By far the best in the Chobe Kasane region. Chobe Safari Lodge has recently been renovated and it offers superb value for money when it comes to accommodation in the Chobe area. Accommodation is either in the luxury River Rooms, the new Safari Rooms, the traditional thatched rondavels or the established Chobe Safari Lodge campsite. There are plenty to choose from when it comes to food venues. The Terrace Restaurant serves a delicious varied breakfast buffet (English or continental style), as well as sampling indigenous African delicacies. Barbeques, specialist game meats, stir-fries, a selection of mouth-watering vegetarian dishes and Indian cuisine are also on the menu. The lodge’s Cocktail Bar offers a range of light snacks. Enjoy a refreshing drink as well while you are enjoying the nearby pool facility. The Sedudu Bar, overlooking the Sedudu Island in the Chobe river, is the place to unwind with a sundowner. Other facilities at the lodge includes an internet cafe, a volleyball and squash court, health and beauty salon, babysitting and a curio and craft shop. Game drives depart three times a day; alternatively, there is an option of booking a full or half-way drive with a picnic lunch. Expert guides lead private cruises throughout the day to suit your individual needs. Fishing for the legendary tiger fish and species of bream provide for an exciting fishing experience. Equipment and a guide is provided. Chobe Safari Lodge, located on the banks of the Chobe River in northern Botswana, is the best destination for serious game viewers. Situated in the town of Kasane, the lodge is close to where the borders of Botswana, Zimbabwe, Namibia and Zambia meet. The Chobe Safari Lodge is the ideal choice of accommodation if you were planning to visit the Chobe area, the majestic Victoria Falls or the Zambezi region (formerly named the Caprivi Strip). The lodge borders on the Chobe National Park, which is part of the Chobe-Linyati-Kwando- river system. The series of islands, floodplains and lakes ensure an abundance of wildlife. 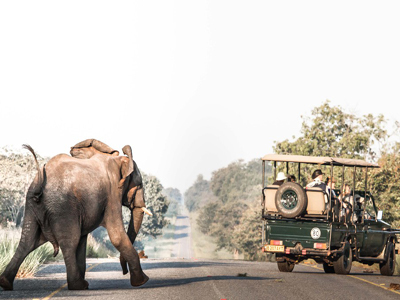 The Park is home to over 80 000 elephants as well as numerous herds of buffalo. In the dry winter season the animals move closer to the Chobe River, so you will be able to view large herds of elephant and buffalo. Other plentiful game include lion, leopard, hippo, crocodile, giraffe, as well as puku, kudu and other antelope. Guests at the Chobe Safari Lodge in Kasane, Botswana, can choose between a number of accommodation types, making this the best value for money destination among the lodges in Chobe. The 22 luxurious River Rooms (with twin beds) overlook the Chobe River. 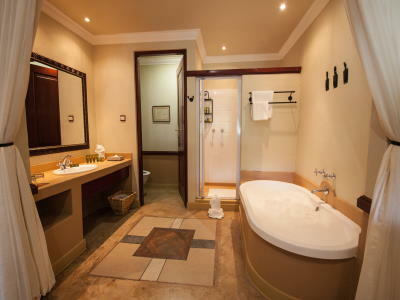 All are en suite (bath and shower), air-conditioned and are equipped with telephone, safe, fan and satellite television. 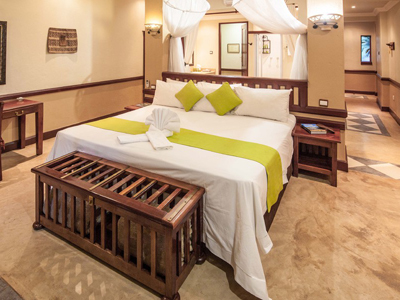 Family Rooms (with a second bedroom and bunk beds) are also available. All units have their own private patio. The River Room complex at the Chobe Safari Lodge boasts a beautiful garden, next to the Chobe river. The complex is connected to the main building at the Chobe Safari Lodge by means of a viewing deck. 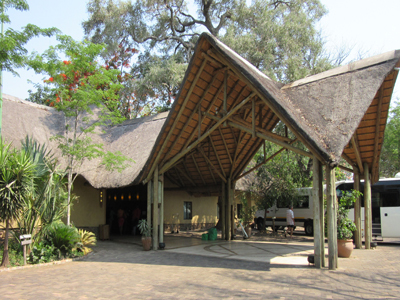 The 46 Safari Rooms are a recent addition to the Chobe Safari Lodge and are close to the main building. All are en suite (with bath and shower) and offer telephone, air-conditioning, safe and satellite television. Each Safari Room has its own private patio overlooking the Chobe River. The 8 thatched rondavels are the traditional accommodation that made the Chobe River Lodge famous. All are freestanding in the gardens of the Chobe River Lodge next to the Chobe River, are en suite and equipped with ceiling fans. The campsite at the Chobe River Lodge sprawls along the banks of the Chobe River and offers excellent ablution facilities. Each site has its own power point and the camp is designed in such a way that you are always near to the ablution facilities. Of all the activities offered at Eagle Island Camp in Botswana (including mokoro safaris, guided walks, early morning and evening game drives, fishing, birdwatching and visits to the Xaxaba village), the helicopter flight over the Okavango Delta is surely the highlight. Because hunting from aircraft has been very limited, the animals are oblivious to the helicopter, so you can really view them in their natural state. The helicopter trip across the Okavango Delta also includes touch-down in a remote, secluded area. Experience silence and peace unheard of in the modern world. An exciting new development is the Chobe Safari Lodge’s little sister. 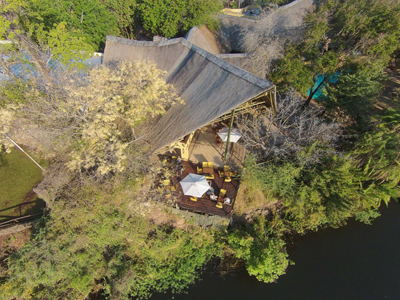 Chobe Bush Lodge is 150 m from the Chobe river front. The flagship accommodation has 38 spacious luxury en-suite rooms each one with open plan bathrooms, showers, air-conditioning, TV and a safe. Bottom rooms has verandas while the top rooms have balconies for a breath-taking view on Chobe National Park. If you decide to visit South Africa after your stay at Fothergill Island, make sure that you spend at least two nights in the Matobo Hills National Park. This park is known for its spectacular rock formations and the magnificent Matobo Hills Lodge. If you prefer self-catering accommodation you can stay at Granite Ridge, an equally beautiful place at a much lower cost. From Fothergill Island you can drive via Zambia to Botswana. 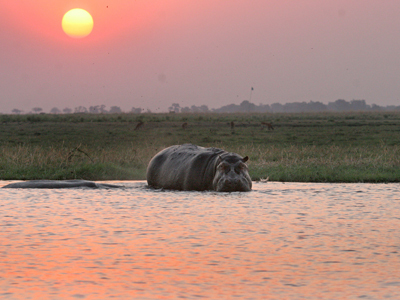 You will most likely stay at least one night in the Chobe Game Reserve before travelling south to the Makgadigadi Pans. The Makgadigadi Pans is the world's largest salt pan. The pans are surrounded by grass which attract antelope followed by large predators. Planet Baobab is near Gweta on the edge of this pan. From Gweta it is only 300 km to Francistown where you can spend a night in the Marang Gardens Hotel before you continue your Botswana tour or before you return to Zimbabwe. Alternatively consider a night in Nata Lodge 100 km from Gweta and 200 km from Francistown. If you travel overland from Fothergill Island and Kariba to the coastal region in South Africa you will most likely overnight in Bloemfontein, the capital city of the Free State. In Bloemfontein Bains Game Lodge offers both luxury accommodation and self-catering on a small game reserve on the edge of the city. Alternatively, you might consider Sangiro Lodge near the Shell Ultra Stop. From Bloemfontein you can easily reach the Wild coast of the Eastern Cape Province of South Africa. Mazeppa Bay Hotel is a family resort near the Qora River in this beautiful part of Africa. Ntaba River Lodge is another family destination, but it lies in Port St Johns. If you prefer city hotels, consider the King David Hotel, a five-star hotel in East London. Orangeriver Lodge offers self-catering accommodation at Noordoewer just two km from the South African border. Your next step might be Ai-Ais Resort in the ai-Ais/Richterveld National park. This lodge is a perfect overnight stop for those who travel to Zimbabwe and Kariba via Namibia. The nearest Lodge in Namibia to Fothergill Island is Namushasha River Lodge in the west of the Caprivi.